The Great Visual Thinking Machine is a set of visual thinking procedures that help one collect new information (especially VISUAL information), remember and recall information, and plan, schedule, and make comparative judgments. 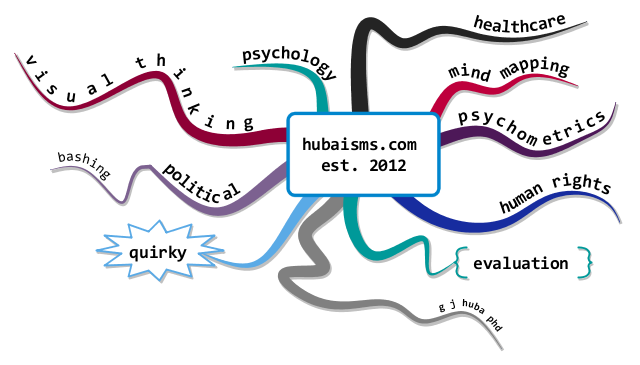 97% of all the topics discussed within 813 posts in this blog (Hubaisms.com) since 2012 have used my evolving vision of The Great Visual Thinking Machine™ or TGVTM™. I developed this model between 2012 and now (early 2019). During that time I have had dementia. Think about that. Now, think about that again. None of my blog posts has been written with anyone else, edited by anyone else, or “approved” by anyone else. The key part of the blog posts — the complicated mind maps and other visual material were similarly developed by me with no directions, information, or revisions by others. Using methods embedded as parts of The Great Visual Thinking Machine” did not keep my brain from continuing to degenerate in the frontal and temporal lobes. This is clearly demonstrated in my most recent MRI and PET scans I reviewed with my primary neurologist last week. I personally NEVER expected that using methods of thinking that were visually-oriented would either heal my brain or slow its overall physical degeneration. But, I did hope that maybe an enhanced ability to think in an effective and accurate way using would slow the decline of my quality of life. Could I do that? I hoped for such an outcome as a result of learning and using new methods of visual thinking and I think that I achieved it FOR ME. Would this work for you? I don’t know. 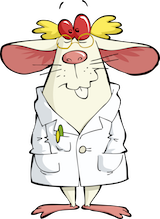 There have been no gold standard random assignment clinical trials. In fact, while much research needs to be done, this blog illustrates over six years that I was able to retain significant parts of my overall cognitive processing levels. The Great Visual Thinking Machine includes cognitive and behavioral skill building, not medical, psychological, or other forms of professional treatment or therapy. Collectively the methods are super-charged ways for taking notes and comparing options The methods include encoding and decoding information in visual ways so as improve memory. These techniques can super-charge virtually all aspects of cognitive processing. One reason I decided to make posts to the blog every few days was that I wanted to document my level of using my brain and new technologies over a period of years. I have done so and you can easily compare the results from 2012 through the present online here. The diagram below is a depiction of The Great Visual Thinking Machine. It is written in the way that I use visual thinking methods to outline my thoughts and communicate them to others. The program used here is iMindMap, the premier way of making mind maps on computers. It is also the core of the major set of different visual thinking techniques that I use, typically in various combinations. 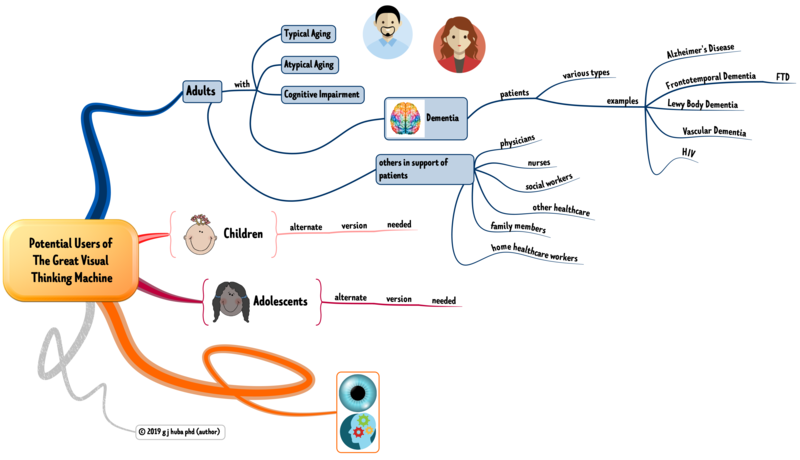 The next mind map shows the potential users of The Great Visual Thinking Machine. This post is the start of a series that explain how to use components of The Great Visual Thinking Machine. I expect to make a new post in this series every 1-2 days.